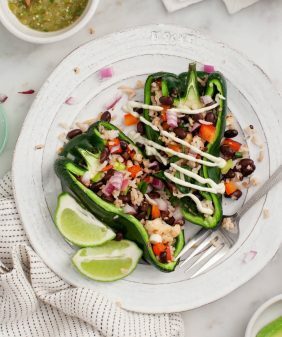 A single ingredient - adobo sauce - makes meaty portobello caps smoky & deeply flavorful in this simple summer burrito bowl. Everyone loves a good burrito bowl, and here’s one that we’ve been really into lately! We love mushrooms, but even if you don’t think you do, give this a try because the preparation is so so delicious! 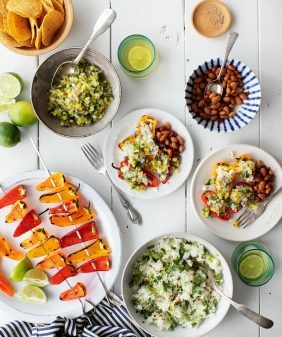 Smoky, charred portobello slices are topped onto bowls of sizzling fajita peppers, beans, rice, arugula, (the quickest) guacamole, and fresh pineapple salsa. 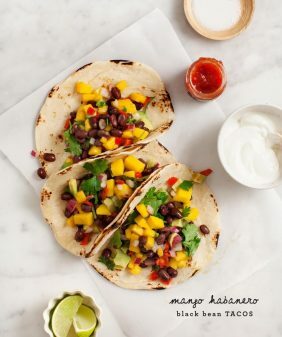 It’s summer grilling at its finest and a great way to use pineapple salsa if you have any left over from making this recipe or this recipe. The mushrooms are seasoned with a simple 1-ingredient marinade. Brush them with adobo sauce (the sauce that comes in the can of chipotle peppers)… and that’s it! Set them aside to marinate while your grill pre-heats. The first time I made these, I was surprised by how juicy and flavorful the mushrooms turned out with so few ingredients and such little effort. I cooked the peppers in cast iron skillet on the grill next to the mushrooms. 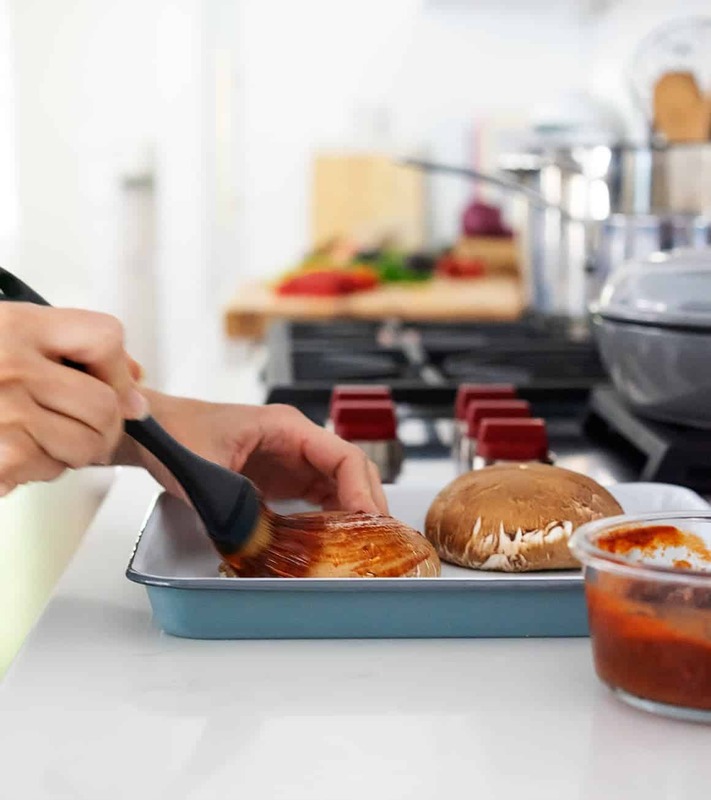 If you also use a cast iron pan, make sure you have an oven mitt handy because this pan is HOT! I can’t tell you how many times I’ve burned my hand on hot cast iron skillets going to and from the oven or the grill. If you don’t have a grill, you could make this recipe in a cast iron skillet on the stovetop. Assemble the bowls with your desired fixings or the ones listed in the recipe below. 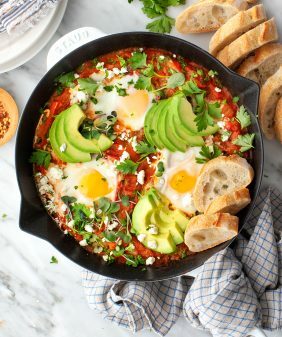 Serve with extra salsa and enjoy! 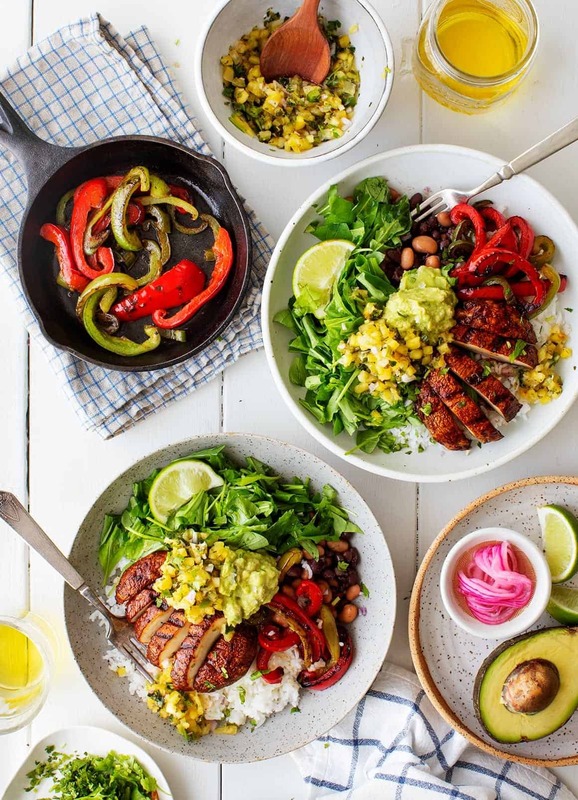 This easy vegan burrito bowl is great for summer grilling! We especially love the smoky chipotle mushrooms and sweet pineapple salsa here. In a small bowl, combine the beans with the olive oil, lime juice, ¼ teaspoon salt, and several grinds of pepper. For spiced beans, stir in 1 to 2 chopped chipotle peppers from the can of chipotles in adobo. Prepare the fajita veggies: Preheat a grill to medium heat with a cast iron pan inside. You'll grill the mushrooms directly on the grill, and the sliced peppers in the cast iron pan. Rub the whole mushroom caps with a drizzle of olive oil and a few spoonfuls of adobo sauce. Use enough sauce to coat the mushrooms well on each side. Sprinkle with salt and pepper. Grill the portobellos (directly on the grill grate) 4 to 5 minutes per side or until charred and tender. Slice just before assembling the bowls. Toss the pepper strips with a drizzle of olive oil and pinches of salt and pepper. Grill in the cast iron pan or grill pan for 8 to 10 minutes, tossing occasionally, until charred and soft. In a small bowl, or directly over the avocado halves, squeeze lime juice and pinches of salt. Mash with the back of a fork to make a quick guacamole. 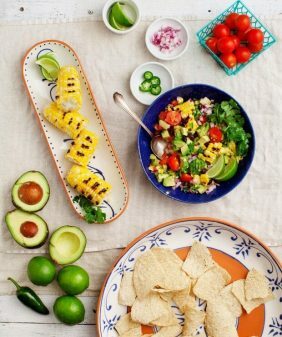 Assemble the bowls with the rice, beans, arugula, sliced mushrooms, peppers, guacamole, scoops of pineapple salsa, and cilantro. Serve with extra salsa and extra lime wedges on the side. (Note: If you would like your arugula and rice seasoned/dressed more, drizzle with olive oil, squeezes of lime and season with a few extra pinches of salt and pepper). In a medium bowl, combine the pineapple, red onion, jalapeño, lime juice and zest, cilantro, garlic, and sea salt. Season to taste and chill until ready to use. OMG, this burrito bowl is a beauty! wow,it looks so beautiful and delicious! I liked the flavor of the salsa and the mushrooms but we found this dish to be too dry. It needs some kind of sauce or dressing. The salsa did not add enough moisture or flavor to the rice and arugula, so overall it was bland. 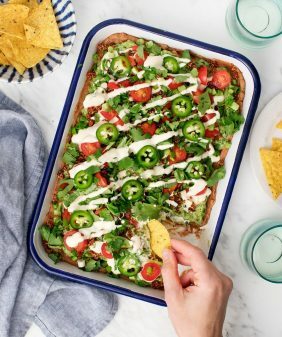 I ate the leftovers for lunch the next day but made an avocado lime dressing to put on top – it made a huge difference. Hi Susan, I’m glad you liked the mushrooms and the salsa. I usually just scoop extra salsa, lime juice, and spread the guac around in lieu of a dressing. Thanks for the feedback, I’ll add a note to the recipe about dressing/seasoning the greens and rice. I used to love making fajitas before I went plant based. I was sceptical about the whole mushroom instead of meat however it is amazing!! I haven’t tried them with the adobo sauce, yet. Looking forward to giving it a shot. Thanks for this. I love how the mushrooms are glistening on the grill. Gorgeous!